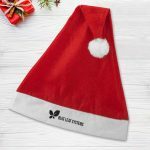 A branded Santa Hat will stand out at any Christmas event or party, adding some fun to the festivities! We know, photos and selfies are a big part of any event or celebration, by adding your logo to a Santa Hat, you can ensure your brand will be a part of the picture. As the images are liked and shared, your logo will grab the attention of the wider audience, helping to create a buzz around your event and brand. If your business fully immerses itself into the festive fun, continue to go all out and treat your employees to a Santa All-In-One! The All-In-One can be worn around the office as part of a fun day, it can make a fun secret Santa gift, or they can be used to simply wish your employees a relaxing, warm and cosy holiday - after all, who doesn't love chilling in a onesie?! The office tree is an important part of the festive build-up and where it’s positioned is carefully considered. It needs to create an impact and placed where it can be enjoyed by all! 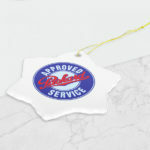 A gift of a branded tree decoration will ensure your business is a part of the festivities. The recipient may choose to add it to the office tree, or keep it for their own personal use, either way, this novelty gift will help your brand to be seen throughout the festive season. These Santa Lollipops make tasty novelty treats! 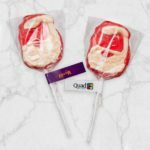 Add the Lollipops to a goody bag, or hand them out at an event. They are a fun item that will make the recipient smile, showing you have a fun side to your brand. Add branding to the tag to ensure you make your mark and stick out! Cooking and socialising is a big part of Christmas; spending time with family and friends through the festive season is what it’s all about. 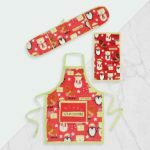 It's often said that the kitchen is the heart of the home, so this Christmas Kitchen Set will ensure your brand is at the centre of the action! Your logo can be added to the set, showing you will be on hand to help prepare and deliver a perfect Christmas. Can we help to add an element of fun to your Christmas marketing with branded novelty gifts? If so, call us on 01623 636602 or you can contact us via the website, or LiveChat. Novelty Gifts to make your seasonal marketing memorable!